Home » 'Bewegen zonder pijn' Nieuws » When to cool or heat in joint problems? 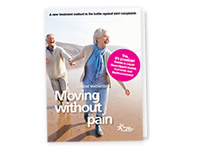 You do not always have to take medication to reduce joint problems. 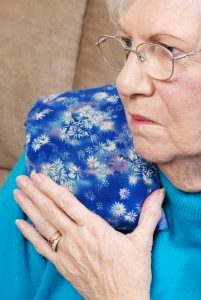 Cold and heat can provide relief for some time. In the case of inflammation and painful joints, an ice compression will help. And in the case of stiff, cold and painful joints warmth can provide relief. Do your joints feel warm and painful? Then ice is a great and inexpensive painkiller. In consultation with your therapist or doctor you can use a cold pack, which you can buy cheap from the pharmacy or drugstore. Even cheaper is to wrap some ice in a towel and put it in a warm and sensitive place. What also works very well is to use a bag of deep-frozen vegetables as a compression. Peas are well suited for this. Always put a towel between your skin and the cooling compress and treat the warm and sensitive place for no more than 20 minutes. Such a cold treatment reduces the pain and helps to reduce swelling. When your joints are stiff, cool and painful, heat is the best way to alleviate the pain. The heat improves the blood flow of your muscles and joints. As a result, the pain and stiffness decrease while moving. Hot packs are available at the pharmacy and drugstore. A shower or bath – no longer than 15 minutes – can also help to warm the joints and make them more flexible. One more warning: do not heat the joints if they are heavily inflamed. As a result, the problems and pain will only increase!